This set of twelve Kenney Beaded Roller Shower Curtain Rings is designed to coordinate with many bathroom hardware finishes! 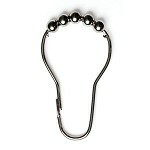 The beads help the ring to glide effortlessly over your shower rod. This package includes 12 beaded roller rings, fitting all standard shower liners and rods!